Oceanfront Home On Private Beach With Panoramic Ocean Views! This gorgeous oceanfront home is located on a beautiful private sandy beach and has panoramic views from every room of East Sandwich Beach and Cape Cod Bay. East Sandwich Beach was voted ''Best Cape Cod Beach'' by Boston Magazine. This spectacular home has a fully-equipped modern kitchen, 3 cable TV's, 2 spacious bedrooms (second floor) with fabulous ocean views, comfortable and newly furnished living room with gas fireplace, additional queen sofabed (first floor)and spectacular ocean views. Enjoy cocktails and barbecuing from the home's ocean-front deck offering sweeping views of Cape Cod Bay. Sandwich is Cape Cod's most historic town; convenient to sightseeing, shopping, fishing, golfing, restaurants and children's activities. This home is available year round.Guests supply their own sheets and towels. We provide pillows and blankets. Our housekeeping service can provide sheets and towels with advanced notice for a fee. 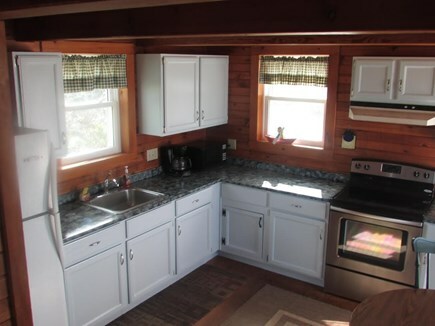 Additional availability info: Home Available All Year Arround For Nightly (Off Season) or Weekly Summer Rentals. This is a Saturday to Saturday vacation rental. Long-Term Rental (1 month or more): Call or email for monthly rate. Please include requested months. Additional pricing info: 2 Night Minimum Stay; $350 Security Deposit; $75 Housekeeping Fee (For Stays Less Than 3 Nights). State and local taxes of 12.45% will apply. We loved staying at this place! Every room had a beautiful view of Cape Cod bay! Bedrooms great for families with kids as there is a queen and a twin. AC's in both! The downstairs had room for all and also those peaceful, relaxing views out of huge windows. The kids loved the private sandy area right next to the deck where we relaxed after a swim. Great gas grill. Would love to return! For our annual beach vacation my family was simply looking for a nice, quiet beach for long walks, beautiful views, sociable neighbors, etc. We found it here on East Sandwich Beach. The house was more than adequate for our family of 4, and besides, who spends that much time in the house when you are literally 15 steps from the beach?? While the "sugar sand" portion of the beach is near the dunes and 2/3 of the beach near the water's edge is small stones, it's absolutely perfect for long walks, skipping stones and building stone castles. You can walk miles toward the Cape Cod Canal, and 0.7 mile toward the east. You can keep going if you're good with a short wade across a small channel. The location of this house is great and the ocean views are gorgeous. The house was clean and the kitchen is well equipped. Brad was exceptionally helpful and very responsive. We had a great time there, I can highly recommend it. Great cottage directly on the beach. We had a good time staying at the cottage, walking on the beach and listening to the waves. The location was quiet and peaceful. Perfect for a short getaway to release some stress. We would definitely stay here again. 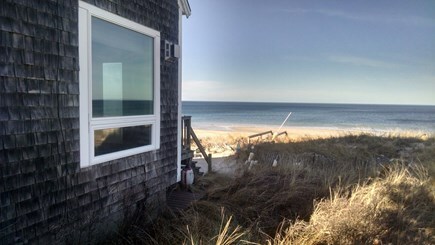 My family just completed a stay at your beachfront property in Sandwich. Right on the beach as advertised. Perfect winter weekend getaway, the fireplace was a highlight. Thanks to the owners! We loved the little house on the beach. It was comfortable and warm. The beach in November was quiet and deserted which was great. We hope to be back.?? The location of this house is great, it is right on the ocean. The house was just the right size for us. Brad was very helpful when I had questions. Great place for a week away! Excellent spot right on the beach! Great stay. Brad was exceptionally helpful. Nice, clean place right on the water. Wonderful views and close to everything. Highly recommended and will visit again. Recommended for: Families with Young Children.